I have now put enough time on all these units to at least reach a basic conclusion in my own mind. And that is that they are far more alike than different. Trying to get clear differences to appear in actual field use in highly mineralized ground is a true exercise in hair splitting. A couple detectors that can be added to the title list are the Teknetics T2 and G2 models. First Texas owns Fisher and Teknetics. The T2 is the predecessor of the F75. They are not exactly the same detector (they do not share coils) but almost identical in performance. The G2 really is just a Gold Bug Pro in different clothes. In actual use the frequency just about says it all. The lower frequency F75 and T2 are just a tad less sensitive to very small low conductors, like a small gold nugget. The 15 kHz FORS is almost an exact match to the Gold Bug Pro/F19/G2 for sensitivity to small low conductors and so despite the bigger frequency gap I would say the FORS models come closer to the higher 19 kHz models than the lower 13 kHz models. I have to say it all just boils very much down to the feature list, and again, they line up pretty well. The less expensive Gold Bug Pro and G2 have a more limited feature set than the F19. The F75 has the most options for tones and settings at the highest price on the list. The Nokta units at their new lower price are a real good value. For me when it came down to actual performance the Gold Bug Pro/ F19 were so close to the FORS models I let the two Fishers go and kept the Nokta. Basically just to get the automatic ground tracking which can be very useful in variable ground but also the three tone option, which is nice for coin detecting. I also like the way the Nokta units balance better with larger coils. All I can tell anyone at this point if you want a detector to use for nugget detecting and also for other purposes, the Gold Bug Pro/F19/G2/FORS Gold and FORS CoRe are so close in actual field use that it will all come down to the operator and ground variations. I think the machines are a toss up from a performance perspective and so just line up the feature list and go with whatever floats your boat. I think for sheer value at this time the Nokta FORS models are tough to beat. The T2 and F75 give up a slight edge on small low conductors. What this means is that all the previously mentioned models are better for smaller gold nuggets. The trade off is the T2 and F75 are better all around detectors for general purpose use, gaining in coin and other high end conductors some slight advantage simply because the machines are not quite so sparky on tiny non-ferrous trash. In moderate to low mineral ground conditions the T2 and F75 have a clear depth advantage on high conductive coins but in very mineralized ground the advantage is nearly non-existent. In my case at least I feel like there is a 90% overlap between my latest version F75 and the two FORS models. If I head out the door right this second to go hunt coins I am more likely to grab the F75 as I like the extra tone schemes. There is the 3H mode that gives a high tone beep on all normal coins but also takes US nickels, which usually reads as a mid tone, and puts it up in the high tone range also. This is a great cherry picking mode. The standard 4 tone mode is great for cherry picking jewelry digging the low mid tones. I like the big screen and the backlight, etc. So I am also keeping my F75. But if I was heading out the door chasing gold nuggets right now in a really trashy location and not wanting to use a PI, I would grab the FORS instead. It pulls low conductors like small gold nuggets out of the ground better than the F75. Not by a huge margin, but enough to matter to me. And that is where it will stay for now. I am waiting to get my hands on the new Makro Racer models this summer, and using the F75 and FORS plus Racer units all summer. Then proceeding to phase two of the weeding process. I am trying very hard to get my detector collection down to just a couple PI detectors and a couple VLF detectors. It is down to that stage of the game however where it just needs a lot more in field use to let things sort out for me. What I can leave you with for sure right now however is that these are all very good detectors that are ridiculously close in performance. You really just can't go wrong with any of them. Mid frequency VLF technology has matured to the point where it is almost impossible for anyone to really stand out from a performance standpoint. Nearly all the performance debates I see on the internet about these models boils down to differences in ground mineralization more than the machines themselves. Just find one that feels right on your arm and sounds good to your ear and get to work! Back at the end of 2013 I made a post about trying to choose between the Fisher Gold Bug Pro, Garrett AT Gold, Minelab X-Terra 705 Gold, Tesoro Lobo SuperTRAQ, and White's MXT. The real point I was trying to make was not that any were better than the others, because in my opinion in all metal prospect mode they are all so close as to hardly matter. My contention is that you should choose one based on all the other features included, such as weight, waterproof or not, tones, coil selection, etc. In my case I just wanted a light, simple detector for looking for gold in the middle of ferrous trash. I went with the Gold Bug Pro mainly because of the simplicity of the machine combined with the under 3 pound weight. Since then I kind of went down the rabbit hole. The Makro Gold Racer came along and at 56 kHz versus the Gold Bug Pro 19 kHz and about nearly the same weight it ended up replacing my Gold Bug Pro. Then I picked up a good deal on an XP Deus with 11" coil in anticipation of getting the new high frequency coil. Then the Nokta Impact came along and now the Minelab GM1000 plus there are more on the horizon. Then there is the fact I am a sucker for a deal and an impulse buyer! First Texas started aggressively blowing out some models at exceptional low prices recently, and the temptations for me have been continuous. I sort of missed that Gold Bug Pro and so when this deal on the basic Gold Bug came along at $337 I was really tempted. However, I wanted a larger coil and so I passed. Then along came this smoking discount on the Teknetics G2 for only $390 with free shipping. Or less. The deal is offered by First Texas direct on eBay and they included the "Make Offer" button. I decided to offer $375 and leave it up to fate. If they accepted the offer it was meant to be, if not I would pass. They accepted! Who knows how low they might go? I guess I should have started lower then ramped it up but $375 at half original price seemed quite fair to me. So why the Teknetics G2? Well, it is exactly the same machine as the Fisher Gold Bug Pro (DP 11" coil version) but with a different rod. It sports what is basically the same rod and handle as used on the F75, which fits my hand better than any other I have ever used. Something about the unique design of the handle that tapers to the top and angles forward. And I like the gray color after all the gold and black machines I have used. The main thing is the Gold Bug DP and G2 both come with the 7" x 11" DD coil as stock, giving me that larger coil. I might have preferred the 5" x 10" coil but First Texas only sells that as a stock coil on the Fisher F19 so this was as close as I could get at a great price. 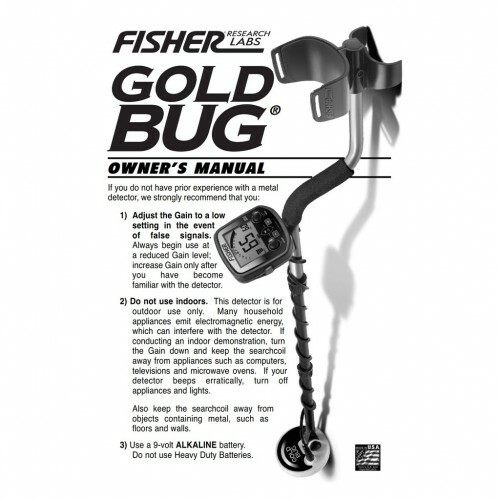 Long story short though is to this day I consider the Fisher Gold Bug Pro to be the best starting unit for anyone wanting a VLF for gold prospecting in the U.S. It is nearly as hot as a Gold Bug 2 on small gold but with better depth on large gold, and easier to operate, lighter weight, lower price - just can't go wrong starting out with all that. It is also very popular, and that being the case it is a benchmark detector against which other machines can be measured. With all the new units I have or will have soon I decided I needed the Teknetics G2 mostly to use as a baseline for comparison tests I am doing this year. At the price I got it at if I decide to ditch it later I will not get hurt much, and who knows, I just might keep it. Especially with the second coil I picked up to go with it. The Nokta Impact I have came with two coils, a 7" x 11" DD coil almost identical to the one on the G2, plus a great little 4" x 7.75" (10.5cm x 19.5cm) DD coil. The closest I could get to that with the G2 for comparative purposes is the slightly smaller NEL Snake 3.75" x 6.75" (9.7cm x 17cm) DD coil. Both are epoxy filled and just 0.7" (1.8cm) thick with coil cover. The G2 is a bit nose heavy with that 11" coil but light as a feather with the little elliptical mounted. Anyway, that's my story and I am sticking to it. The G2 will be used in the field alongside the Gold Racer, Deus V4, Impact, Gold Bug 2, Gold Monster 1000, and whatever else comes along over the next year as the baseline test unit. What I often do is overload myself with new models and then let nature run its course. As time goes by I will grab certain ones I like for various uses, and others will tend to sit in the corner. It may not be efficient but it does work for me in deciding what I like to use. And that is the final thought I want to leave you with when it comes to VLF however is this. It is not all about just sheer performance, as these machines are all so hair splitting close these days. That is why each model has thousands of fans on the internet - they all work well. Like a good pair of boots you just have to find the ones that fit you best. At the end of the day the only way that has ever worked out for me is to try them out myself. I will let you all know what I think over the course of the year. Fisher Gold Bug Pro / Teknetics G2 For Meteorites ? ... Is Fisher Gold bug-pro / TekneticsG2 a suitable meteorite detector..?